A tight control of magnesium homeostasis seems to be crucial for bone health. On the basis of experimental and epidemiological studies, both low and high magnesium have harmful effects on the bones. Magnesium deficiency contributes to osteoporosis directly by acting on crystal formation and on bone cells and indirectly by impacting on the secretion and the activity of parathyroid hormone and by promoting low grade inflammation. Less is known about the mechanisms responsible for the mineralization defects observed when magnesium is elevated. Overall, controlling and maintaining magnesium homeostasis represents a helpful intervention to maintain bone integrity. Nutrients. 2013 Jul 31;5(8):3022-33. doi: 10.3390/nu5083022. Castiglioni S, Cazzaniga A, Albisetti W, Maier JA. Department of Biomedical and Clinical Sciences L. Sacco, University of Milan, Via GB Grassi 74, Milan I-20157, Italy. According to one of our Medical Advisers, Dr. Carolyn Dean, the statement in the above study “Less is known about the mechanisms responsible for the mineralization defects observed when magnesium is elevated,” because the instances of elevated magnesium levels are so rare. The only time Dr. Dean has heard of elevated magnesium levels is in a hospital setting where too much intravenous magnesium is given at one time. However with magnesium having many routes of elimination: kidneys, colon and sweating through the skin, magnesium almost never becomes chronically elevated and therefore there is no record of negative effects on mineralization. It appears that the investigators involved in this study are following the current trend of treating vitamins and minerals as if they are drugs and holding open the possibility that magnesium has negative side effects. However, we at the NMA have not been able to document negative side effects of using magnesium. Carolyn Dean MD, ND, has listed ten main reasons why you might feel worse after taking magnesium. Actually it’s usually not magnesium that’s making you worse but just the way you are taking it or other things you are or aren’t taking along with it. 1. You’re not taking enough: When people feel worse with magnesium, I believe that the 700-800 enzyme systems that require magnesium just get jump-started and They Want More! (I used to write that magnesium was necessary in 325 enzyme systems but now, according to many and documented by Dr. Andrea Rosenoff, that number is more than twice what we previously thought. This doesn’t mean that you’ll increase your magnesium ad infinitum! You will reach a saturation point of your magnesium stores and will be able to decrease your magnesium intake. To determine your magnesium saturation point, get a Magnesium RBC (Red Blood Cell Count) test. The range is usually given as 4.2-6.9 mg/dL; the optimum level is between 6.0-6.5mg/dL. 2. You’re taking too much: You can also feel worse on magnesium if you take too much, too soon. This usually happens if you have fatigue and weakness from magnesium deficiency. Anyone in this category should start very slowly on any new supplement or drug. If you take a high dose of magnesium right from the start it’s like taking muscles that powered a bicycle and expect them to power a jet. Your body might just be so weak that revving up 800 enzyme systems all at once makes you feel jangled and even anxious because you don’t know what’s going on. Start with one quarter of the recommended dose of magnesium and work up as your body adapts. 3. 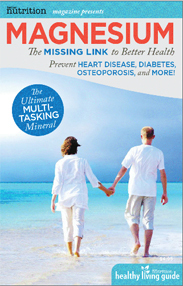 You have low blood pressure from long standing magnesium deficiency and adrenal fatigue. You may have heard that magnesium can lower your BP so you worry about that happening when your BP is already low. This is another instance where you must begin by supplementing at about one quarter the recommended dose of magnesium and slowly build up. Electrolytes and natural trace minerals are important in this case as well to support adrenals and thyroid and improve potassium levels. 4. You’re on heart medications and as your health conditions improve, your meds are becoming “toxic.” That’s because you may not require them anymore! Check with your doctor when you are using magnesium to treat health conditions and want to wean off your meds. For example, magnesium helps lower blood pressure. If you continue to take the same amounts of BP meds, your BP might get too low. This is not a “side effect” of magnesium. It’s a side effect of taking drugs when you don’t need them. Magnesium balances blood pressure. If you have low BP to begin with and are not on meds, start magnesium very slowly because, as I describe in #2, you want your body to slowly adapt to a mineral you may have been deficient in for a long time. 5. You’re on fluoridated medications that bind up your magnesium and make you deficient even when you’re taking magnesium. See a list of fluoridated medications at the Fluoride Toxicity Research Collaborative. 6. You’ve started taking iodine (in doses above the RDA) that speeds up your metabolism giving you heart palpitations that has nothing to do with magnesium deficiency. 7. You’re taking too much Vitamin D: Here’s what happens. You feel great on your magnesium and then you begin to get magnesium deficiency symptoms after adding a high dose Vitamin D supplement. Magnesium is required to transform Vitamin D from its storage form to its active form and for many other aspects of Vitamin D metabolism. That means if you take the extremely high doses that allopathic doctors are now recommending you can plummet into magnesium deficiency and not know what the heck is happening. In general, I don’t recommend more than 1,000-2,000 IU of Vitamin D daily for this reason. And never take Vitamin D without magnesium. 8. You are taking too much calcium and it’s pushing out your magnesium. Magnesium is the dynamo behind calcium. They are both necessary and equally important for strong bones and many other processes in the body. Calcium (in the carbonate, citrate and gluconate forms) is only 4-10% absorbed. Unlike magnesium, calcium doesn’t flush itself out with diarrhea if you take too much. Calcium, instead, causes constipation and builds up in the body. Some researchers are saying calcium supplements are responsible for an increase in calcification causing heart disease, kidney stones, gall stones, heel spurs and fibromyalgia. Part of that buildup has to do with the fact that few people take magnesium with their calcium. It also has to do with the type of calcium taken. What’s the solution? We should try to get as much calcium as we possibly can from food sources. Go to The World’s Healthiest Foods, type in calcium to get a list of calcium-rich foods. If you do the math, you’ll see that we get much more calcium in our diet than magnesium. 9. You’re just taking magnesium and becoming dehydrated because you don’t take any other trace minerals. Take 1/8-1/4 tsp of sea salt in every pint of water you drink. How much water per day? Half your body weight in ounces of water. 10. Magnesium is getting into your cells and detoxifying chemicals and heavy metals. Sometimes this can feel like a healing reaction. I recommend that you build up your dosage slowly as the cells detoxify and are finally able to work efficiently. The ideas, procedures and suggestions contained in this article are not intended as a substitute for consulting with your physician. All matters regarding your physical health require medical supervision. Neither the author nor the publisher shall be liable or responsible for any loss, injury or damage allegedly arising from any information or suggestion in this article. The opinions expressed in this article represent the personal views of the author and not the publisher.